A true american wild man, crazy to some, friend to many, boring....NOT! to Velma & John Parmerton Jr.
Long Island, New York has been home (on and off) for 58 years. "The Street " above all else. Being smart on the streets of NYC is an essential to living here. Training with the Philadelphia Orchestra At Saratoga Arts Festival with Mr. Glenn Dodson, principal trombonist. Training at Julliard School with Mr. Edward Herman, principal trombonist New York Philaharmonic Orchestra. Training with Mr. Charles Vernon, bass trombonist of the Chicago Symphony Orchestra. "Every minute of life is an education, if you see the opportunity to learn." "Why are you looking at this rock? go out and celebrate life"
"Happiness begins with facing life with a smile and a wink"
"A wink is as good as a nod to a blind man"
"My life has been blessed with a love of music and the ability to share it". My first life with music began as a professional jazz and classical trombonist/arranger/composer. I garnered an appreciation of popular music at the age of 17 (1976) and began actively collecting it, mixing it and sharing it. Moving from the stage to the floor in 1990, I started my education in the art of social ballroom dancing. in the Pennsylvania Hotel and the legendary North River Bar was fueling the local appetite. With the encouragement of music mentor John Festa, I decided to give swing DJ'ing a try. John handed me a paper with the 3 rules for acceptable West Coast Swing Music: "Saxophones; Stripper Music; Female Black Vocalists". 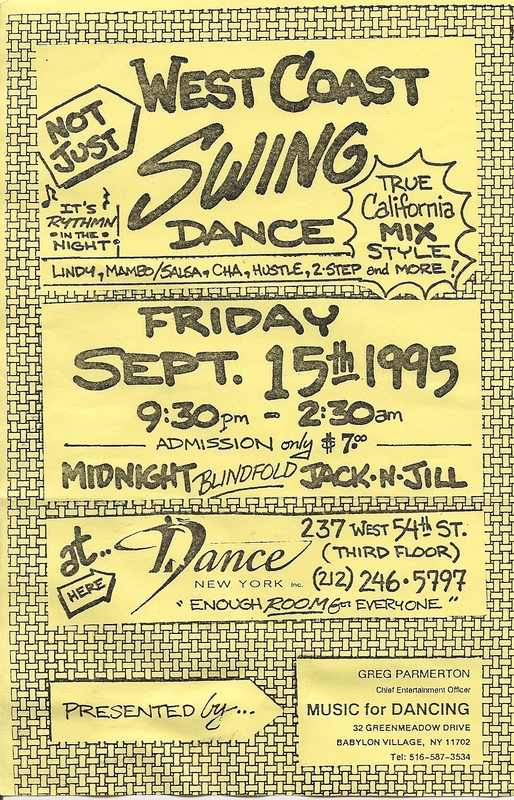 In 1995 I started my first series of public swing dance events called "rhytmn in the night" and coined the term "California mix". These were mixed dances with a strong emphasis on WCS music with Country 2 step, Niteclub 2 Step, Cha-Cha, Salsa, Hustle and small smattering of smoothies and a waltz mixed in. This type of dance mix was being played at the mecca of West Coast Swing dance, the Press Box in Westminster Lanes (OC, C.A.) by Kenny Wetzel at that time. 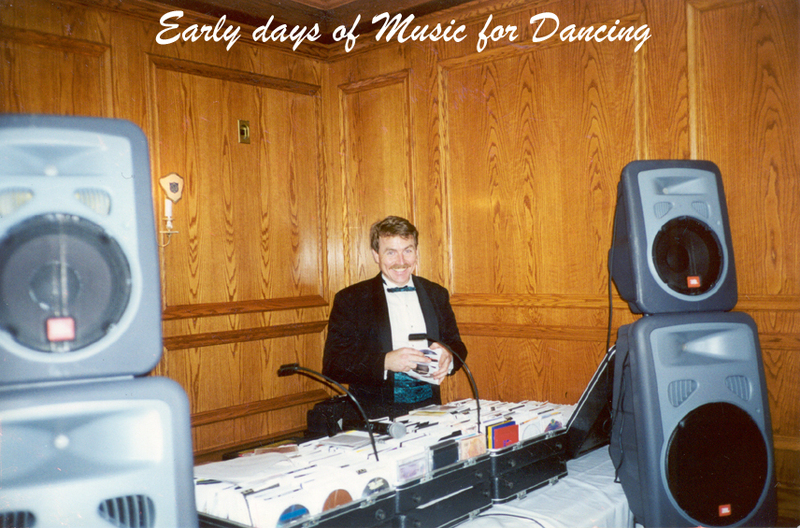 In 1995 Music For Dancing Entertainment Services was registered, licensed and insured in NY. Key West, Fort Lauderdale and onboard. 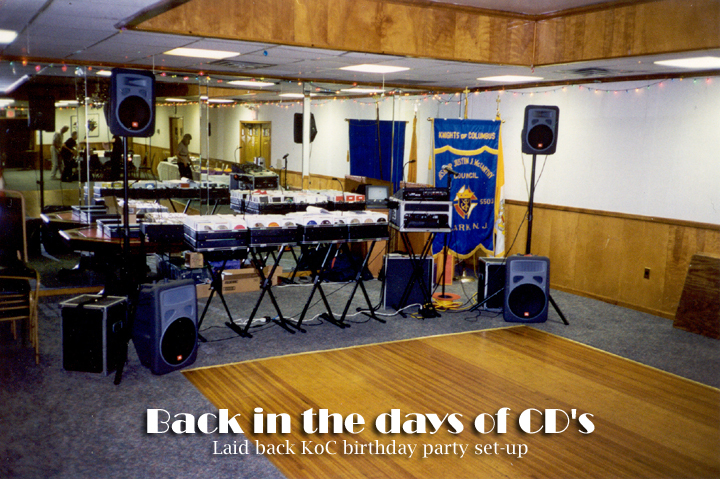 I have DJ/MC'ed over 2650 entertainment events since 1994. Past president of the National Association of Rhythm & Blues Dj's (NARBDJ). 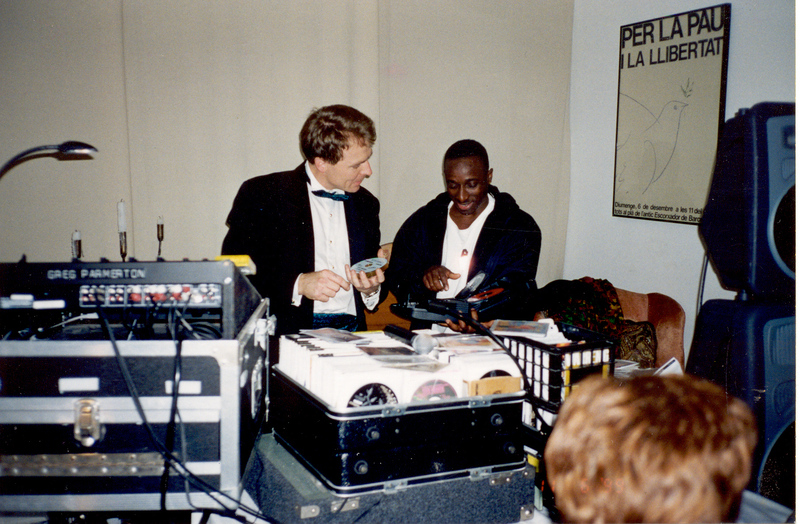 Inducted into the Swing Dj Hall of Fame in 2006.
look at the amount of CD's on hand ! Abba can be mixed with Bob Marley! I always take the time to listen to advice, there is no way any one person can know everything about music. I've known Frankie Manning since 1990 at Sandra Cameron's Dance Center, and Eddie "the king of swing" Sanabria almost as long too! Always has a big smile and hug for me, I love Dawn for all the light she brings to this world. 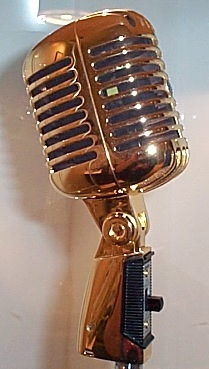 Hey, I used to have a microphone! I got "fired" for using a microphone! no really, I used to DJ for the NYSDS regularly in the 90's then one day the mandate that I can not use a microphone anymore to DJ??? look up the definition of DJ; how do you announce and present music without a microphone? 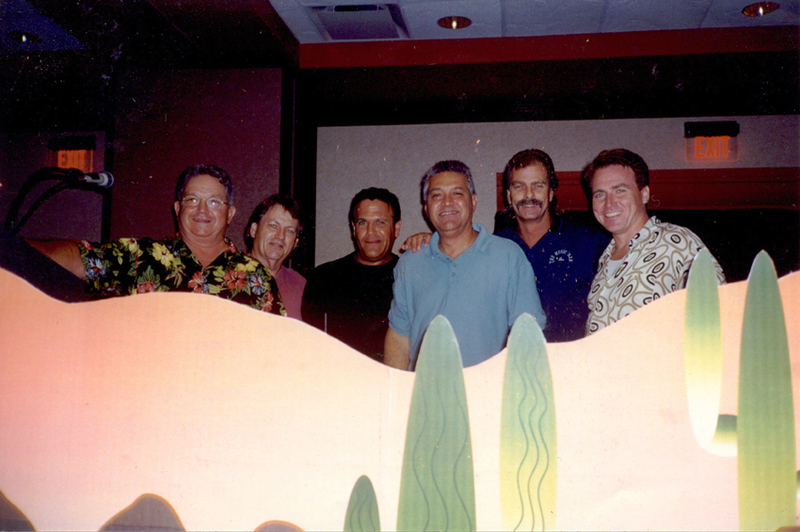 Chuck Beaston, James Buchanan, Dan Mezrich, Mike Gallo, Joe Robinson and Greg Parmerton round-robin throwdown back in the day! This was a rainy night at the Boat House Restuarant's catering room. I thought the booth looked good and simple. The Dj did'nt get aboard the ship? He will board in 4 days? 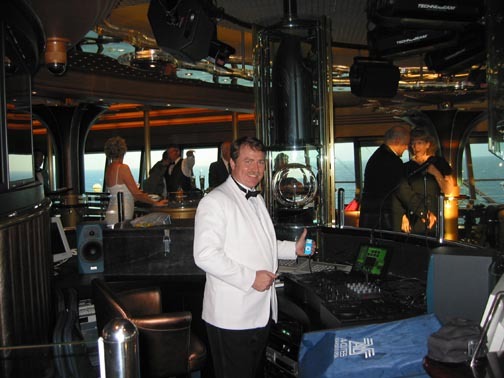 in 2007 I had the honor of working for DanceFun cruises aboard the Sapphire Princess (Australia-New Zealand) as the emergency DJ with 3 iPods and one cord! This was the set up for Sophia Lauri's Communion reception in May 2008. This was the first time I used my new EON G2 speakers, did'nt even need the sub woofers they sounded GREAT throughout the entire room. This was formal 1920's themed party, was great fun! I used my "travels light" iDj2 headunit (pro amps and speakers on site) and the tails looked ok too. 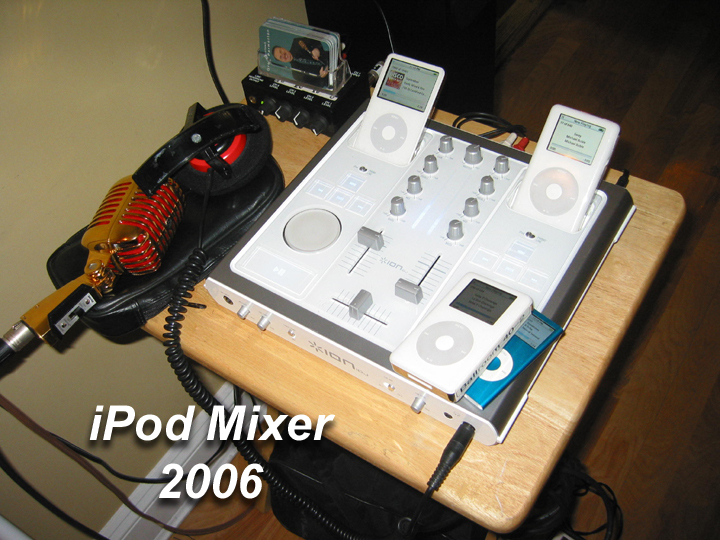 In an effort to get as small as possible a mixing board and player solution, I used the iDj iPod mixer with eight iPods for two years prior to the iDj2 release. The iDj mixer did not have master tempo and was really just a cue and mix two source unit. 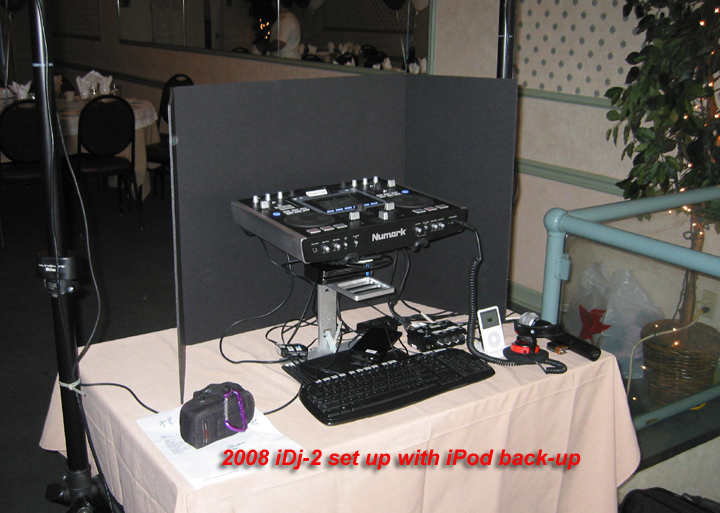 I did alot of parties with this setup. Got a singer in the family? Need a small sized booth? This is all you need for a rockin' good time in less than five feet of space! 2008 small restuarant party set up. Behind the facade is the powerhouse. The iDj-2 is a professional digital entertainment system paired with powered speakers by JBL makes for an extremely small footprint in your party. How Swing Deejays determine the music you dance to! 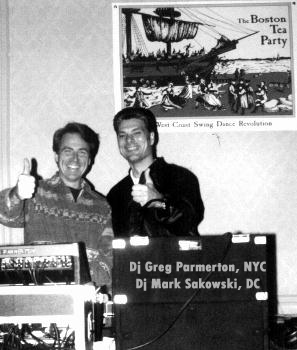 There are about 100 veteran Swing deejays across America who make an absolute "art" of finding and playing the best dance music for Swing conventions. They belong to deejay discussion groups, they meet regularly at Swing events and they usually have more than 10,000 songs loaded onto their laptops. 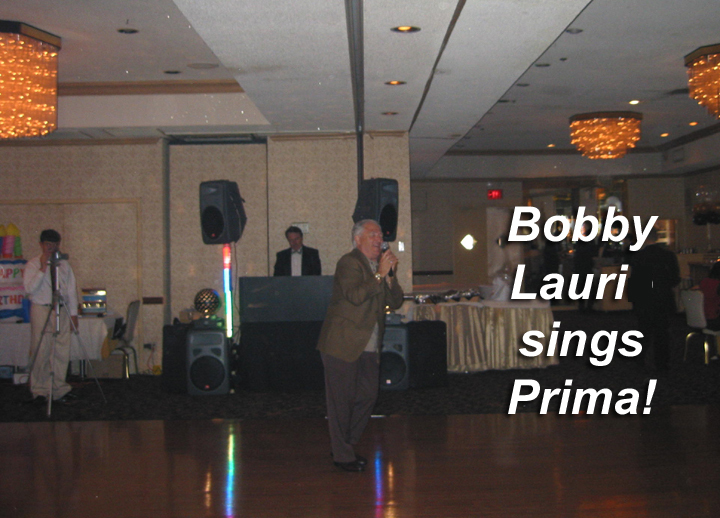 The VERY BEST of these deejays are hired by event directors to select the music for Competitions and Social Dancing at the Major dance conventions across America. It's time we get into their heads. Deejays have a tough job. Dancers at Swing events have a wide range of music and dance tastes. Some like old-fashioned Blues. Some prefer R & B. Others like a little Funky Hip-Hop edge to the music. Still others want to hear a mainstream Contemporary Pop sound. Clearly, it's hard to please everyone's tastes. USASN: What's the most popular style of Swing music being played at dance conventions around the country these days - Pop, R&B, Hip-Hop, Contemporary? GP: Pop music seems to be the most popular type of music being played for a very short amount of time (meaning that they are like "pop-tarts" - sweet and tasty but not too nutritious). Blues and Jazz songs have a longer visitation period over time. Anyone heard "Crazy" by Gnarls Barkley played lately? I'm sure you still hear "Like I Love you" by Mike Morgan and the Crawl every big weekend. USASN: What's the most popular beat range for Swing music at most events? GP: Right now I would put that “sweet spot” at 108 bpm [beats per minute] - which is harder to dance to for Beginners. Intermediate and Advanced dancers love this tempo - and lower. 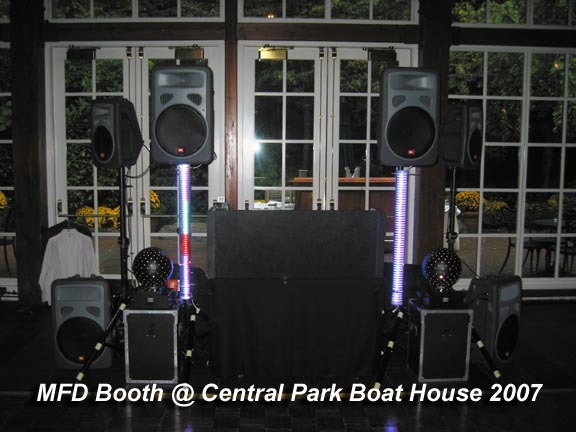 USASN: What kind of songs do most deejays in your professional group like to play to get dancers on the floor? GP: Mostly "they like" Swing-beat songs that have a Syncopated Triple built into the rhythm of the song. But they are mostly Professionals (or want to be) and they will play what keeps the most folks on the floor. What a deejay likes and what his audience likes are many times two separate things. USASN: Are there different music preferences in different regions of the country? GP: Oh yes! California is the first in all things that “might" swing; only time sorts it all out as to what "did" swing. The fine dancers from Houston have been pushing the bpm envelope lower and lower into what was known as "buckle polisher" or "belly rubber" tempos. Chicago still has a strong Stepper music scene. The Shag states seem to have a Traditional vs New music issue brewing for the past few years. Lindy is still big in Boston, NYC, LA, and San Francisco. USASN: What kinds of things do the Swing deejays discuss among themselves? GP: Mainly, does the song "swing"? Or, are we trying to add a Swing beat over it? Or --- can you believe that they like this song?????! USASN: Are there any notable trends in Swing music over the past few years? GP: Really, the move against the R&B and Blues music into an area that confounds the audience into a non-Swing-based musical experience. This has been promoted by the “Pros” through routines and class music without regard to the genre of music that does swing. USASN: What makes a good Swing song? GP: Rolling triples. Or as my Jazz teacher said, “lazy triplets over a straight beat’’. Pulsing to the upbeat like a "heartbeat". 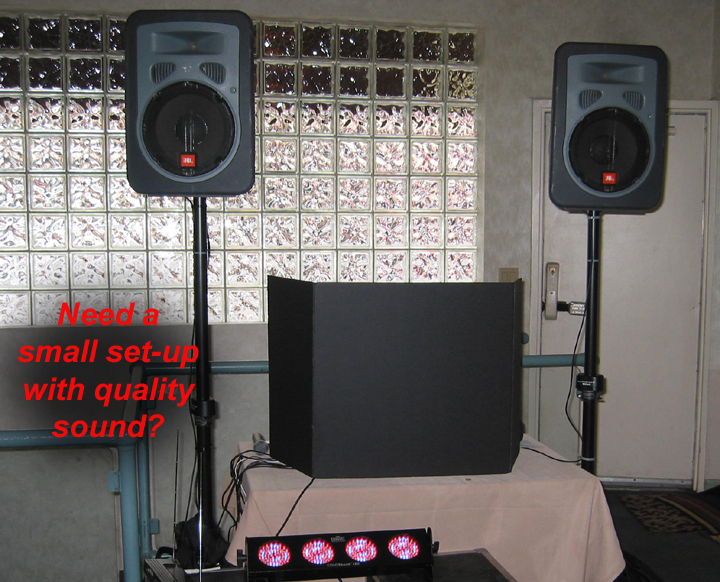 USASN: What is the primary job of the deejay at an event? GP: The amount of Feet on The Floor. "90%" is the [participation] factor we use as a "play or flay". No matter what we think is best, the audience on the floor is correct. 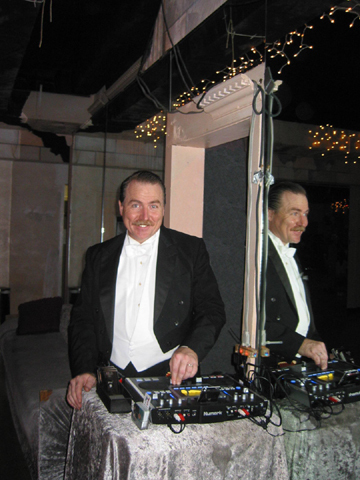 USASN: What makes a great Swing deejay? GP: Ability to adapt. The floor is alive and always changing. A great Swing deejay must find the way with the tools at hand to adapt and keep the majority of the dancers on the floor. USASN: What do deejays do to prepare for a gig that people don't realize? GP: Basically we plan our attack mode - are we "Competition" deejays or are we "Social" deejays? This is what we do 24+ hours before our play time. We are always listening to music every chance we get. USASN: How many songs do you think most deejays have in their music libraries? GP: I would say, almost every AllSwingDj has at least 18,000 Swing songs on hand while performing. USASN: What popular song styles seem to be preferred by dancers at recent Swing dance events? GP: Believe or not, the "throwback" stuff is the most popular. Ask any deejay. Amy Winehouse has some killer old-school sounds. Taylor Dayne and Janet Jackson are keeping the dance beat in focus, as well. The old-style acoustic blues of Keb-Mo, Brother Yusef and Jack Johnson are very popular. USASN: Why do you deejay? GP: To feel a crowd’s reaction to my presentation. I really get a kick playing music for people who want to dance - be it The Macarena, The Cupid Shuffle or Spankin' Leroy. Being the conduit for people having a good time is both, a great reward and an honor. USASN: In what direction does Swing music preference by Social dancers seem to be trending over the past 5 years - Blues, Pop, Hip-Hop, R&B, other? GP: Away from anything that does swing, as evidenced by the next two questions. USASN: Name several artists over the past few years whose music heard on the radio is especially popular at Swing events. 3. Ne-Yo - Can We Chill? USASN: Name 5 songs that broke over the past few months that are really hot right now for Social dancing at Swing events. USASN: Pick 10 songs that you'd consider all-time classics for Social Dancing. Notice that the "popular" and "hot right now" at swing events listings are not played anymore? It is because they are "pop-tarts"
The classic list can be played at ANY time, because they are swing.